Samsung and Vodafone Group have announced the new stylish, advanced Samsung GALAXY Tab 10.1 (P7100), which the Korean consumer electronics giant claims as its first Android 3.0 Honeycomb-powered dual-core tablet, featuring a large 10.1″ WXGA screen, 8MP camera, Bluetooth 2.1 and Wi-Fi b/g/n connectivity, available in 16GB or 32GB (built-in memory) model. “As a leader in the Android-powered tablet market, Samsung is committed to providing a variety of feature-rich, always-on devices,” commented DJ Lee, Executive Vice President for Head of Sales & Marketing at Samsung. 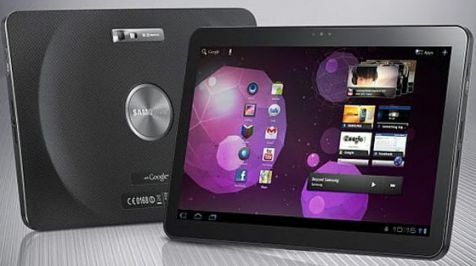 “The Samsung GALAXY Tab 10.1 is a valuable addition to our expanding portfolio of smart media devices. Sporting a large 10.1 screen and dual surround-sound speakers, it enables users to enjoy multimedia to the maximum extent without having to compromise mobility. The new slim, lightweight Samsung GALAXY Tab 10.1 tablet which measures 246.2 x 170.4 x 10.9 mm and weights in at 599 grams is scheduled to be available this Spring through Vodafone, but no words on its exact launch date and pricing details yet.